Nowadays you can get Krispy Kremes almost everywhere, even overseas, but back when I came to DC from Connecticut the only doughnuts I was familiar with were Dunkin’s cake varieties. So my first bite of this yeast-raised doughnut coated in cracking sugar was nothing short of a sweetness revelation. And I’m not even much for sweets – BUT! A box of warm doughnuts in my lap on a late summer’s night, the delicate outer crunch of sugar followed by the soft dough inside… just heavenly (wow, was that a bit of drool hitting my keyboard?). Krispy Kreme the company has a long and storied history you can explore elsewhere. Dating back to the late 1930′s, they’ve been hawking the sweet stuff mainly in the South until just a few decades ago when the expansion began. I remember the sad day the old diner in front of the production plant in Alexandria closed, and they opened a spanking new storefront next door as part of their rebranding efforts. Just not the same – so clean and cold – so the nightly pilgrimages ceased. When they went public around the same time we all had visions of becoming Krispy Kreme stock millionaires, but that dream also went the way of melted sugar. Part of the fun of eating a Krispy Kreme original glazed doughnut comes before you even take a bite. From the anticipation of seeing the “Hot. Now.” sign light up to watching the production line of dough being flipped, fried, and coated – it puts you in touch with a kind of carnival kid feeling. 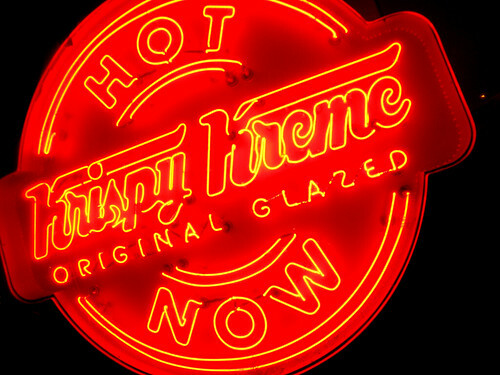 But now it’s confession time – the original glazed, as delightful a taste as it is, is not my favorite Krispy Kreme doughnut. That honor goes to the maple iced, which gilds the lily by pouring an additional maple icing on top of the original glazed. Um, there’s that drool again. Sure you can get Krispy Kreme’s in grocery and convenience stores but I urge you to just say no, it isn’t the same taste at all. 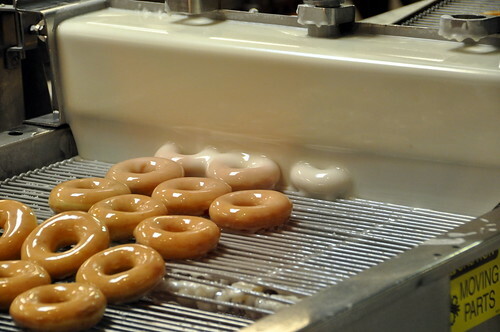 Hit the Alexandria, Rockville, or Dupont Circle store locations to get the full hot fresh sugar melt experience. 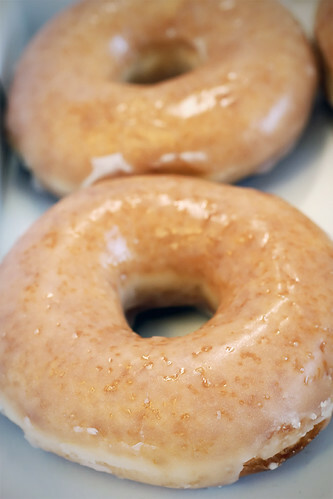 The Alexandria store is the original factory where I first fell in love with the original glazed; the Dupont Circle store has doughnuts delivered to it daily but does have a mini-ramp to watch the flip, fry, glaze process. 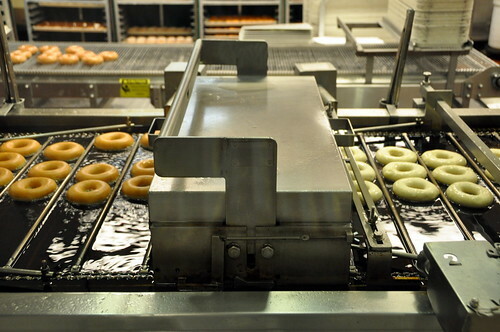 Back in the day we really did call it “the ramp of love” – and my heart still skips a bit as the doughnuts bounce happily down to the hot oil and through the sugar wall. Sigh. I’m a big guy, and I know I could stand to lose a few pounds. And it was pretty tough to do that when I worked at Dupont in 2007, because every morning I’d come up the south escalator from Metro, and that sign would be staring me right in the face. The old line is ‘location, location, location’. I don’t know how much Krispy paid to get that spot, but they must be rolling in the money- that’s the kind of advertising you can’t beg for. I fell in love with Krispy Kreme as a lad in Raleigh. Jenn, your intuition is right – Dunkin Donuts is genetically inferior to Krispy Kreme. Yummmmmm! Ahhhhhhh a NC Delight! The customer service is AWSOME! Fantastic donuts nobody compares. Love it!